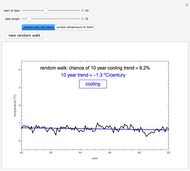 The Earth's global average surface temperature from 1970 to 2009 can be modeled as a random walk with a warming trend. Despite the overall warming trend, short time periods can show cooling. 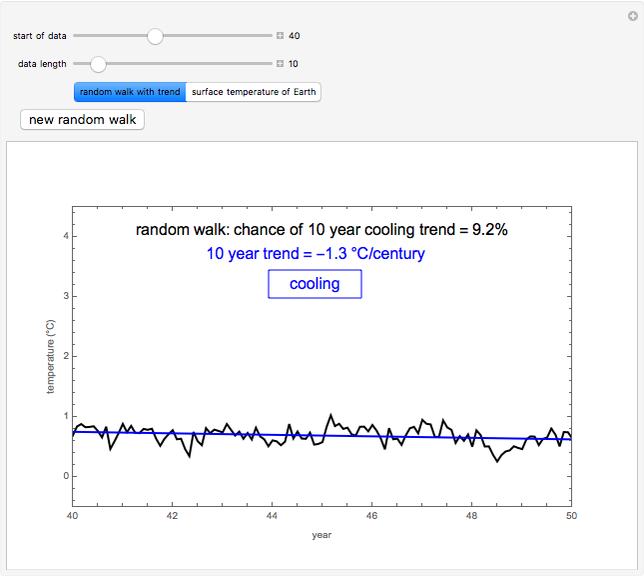 Explore how the likelihood of short-term cooling in a random walk with a warming trend depends on the length of the time period and compare with the Earth's surface temperature. 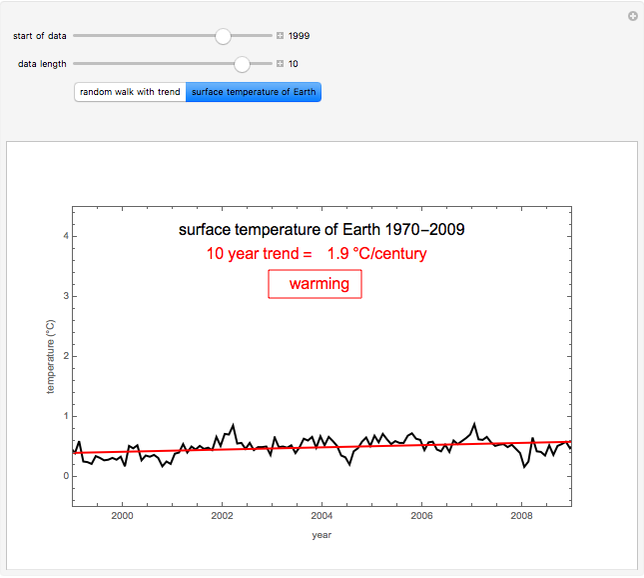 The global surface temperature of the Earth since 1970 can be approximated by an ARMA(1,1) process plus a linear warming trend [1, 2]. The dataset used for the Earth's surface temperature is the monthly global-mean Land-Ocean Temperature Index from the Goddard Institute for Space Studies at NASA . 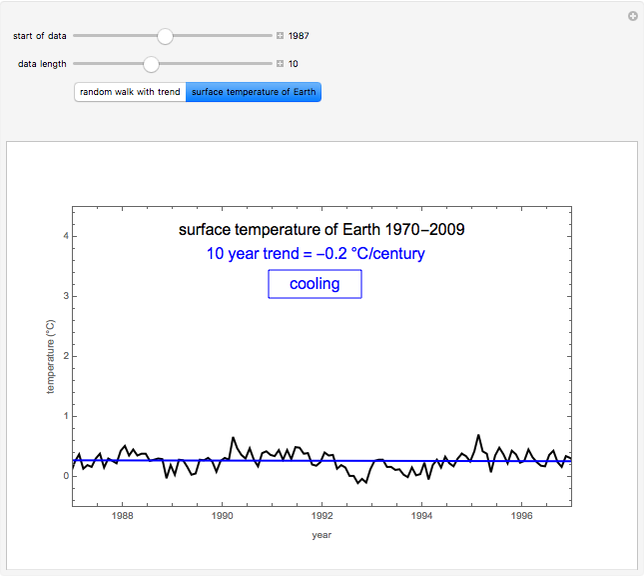 The parameters for the ARMA(1,1) process were obtained by removing the trend from the temperature record and then fitting to an ARMA(1,1) process using the statistical software package R . The probability of seeing a short-term cooling trend was obtained from simulating the resulting ARMA(1,1) process plus trend for 100,000 years. This Demonstration was inspired by a blog post at Open Mind . J. D. Cryer and K.-S. Chan, Time Series Analysis With Applications in R, New York: Springer, 2008. H. von Storch and F. W. Zwiers, Statistical Analysis in Climate Research, Cambridge: Cambridge University Press, 1999. 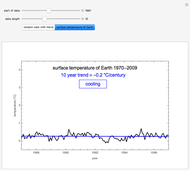 Goddard Institute for Space Studies Surface Temperature Analysis. Open Mind, "Don't Get Fooled, Again". Jeffrey B. Weiss "Short-Term Temperature Trends within Long-Term Warming"